Karan Gupta started Art Box in Dwarka in January this year. This new performance arts' terrace hosts regular dance classes (locking and popping anyone? ), live amateur bands and have an art night planned soon. It’s a venture with a good heart intended at promoting all forms of performing arts. 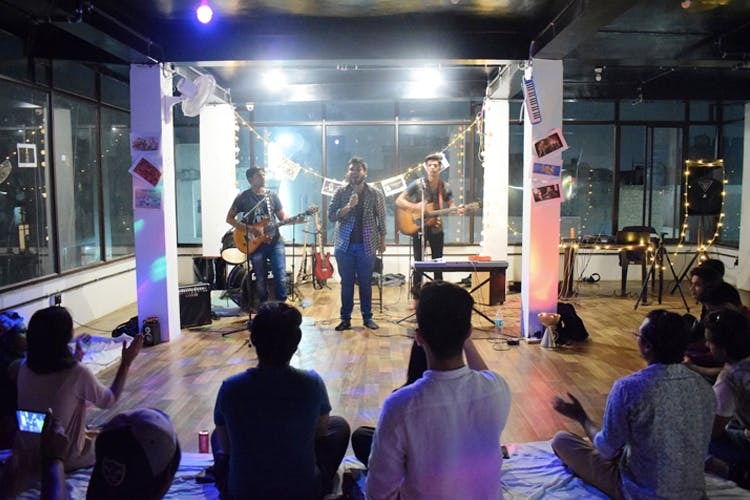 Apart from their regular dance classes, they invite newbie bands to host gigs and on August 18, they’ve planned an art night where all these disciplines will come together. It’ll be a chance to hear fresh talent perform, enjoy some dance routines and even create artworks with fellow artists. Karan told us that they run special batches for dance classes for the underprivileged for free. You can sign up for a 3-hour dance class, send your kids to make music or just drop by for the art party to experience everything they do in one go. From the looks of it, the small space looks really cosy with its pretty fairy lights. We also love the musical instruments and audience huddled up on mattresses for events. Goes on to show how rustic and underground this place is. We’re told they had to put a brake on the events because the terrace space got too hot to handle. With its glass wall and one overworked AC, they were unable to accommodate 40–50 people comfortably. Come September and they’re hoping the weather will be kinder but if you’re still hung up, wait till next year to drop by (they’ll have another AC installed by then). Their FB page has videos of the events they hosted in June in case you want to see how those went down. It’s also where you can look out for their upcoming events. The entry for their meet-ups has been free so far. Yeah, good folks, right there.